Hatters striker James Collins is determined to continue his red hot streak in front of goal. The forward was on target for the third game running at the weekend during the 3-0 win over Wycombe Wanderers making it 19 for the season and nine in his last seven matches. I’ve worked hard for it over the years, so I’m just going to enjoy it now. I don’t want it to end and I want this team to keep winning. Collins’ form saw him named the Sky Bet League One Player of the Month for January in the build-up to Saturday’s clash, as the striker was on press duties for the third game running too. He said: “It seems to be a regular occurrence here in front of the camera with you guys, but you wouldn’t want it any other way really. “That must mean you’re doing something right, so it’s a pleasure to be standing here again. It’s been surreal, but you want to take it in. “I’m not going to take it for granted, I’m not going to think that I’ve achieved anything yet. “I’ve got three goals this month and I’m going to try and kick on and get as many as I can before the end of the season because as I keep saying, getting promoted is the main aim this season. “I’d do anything in my power to get us promoted as I know what it means to everyone at this football club. “Once you score a couple of goals, the confidence is there and things start falling for you, you start making more runs and the luck stays with you. “I’m doing what I’ve been doing for the last 18 months, but I think more things are falling for me at the minute. Collins was also quick to praise team-mate Jack Stacey for the manner in which he picked his run out to the near post on Saturday. He continued: “Jack, he’s on fire at the minute. He keeps setting up goal after goal for me and whoever else. Collins was upfront alongside Danny Hylton once more at the weekend, with Kazenga LuaLua missing out through injury. Some supporters had expressed concerns that the pair could play together, but the striker continued: “We don’t really listen to stuff like that. “Whoever scores on the pitch, it is what it is, but I’m delighted that I managed to score another one. “Kaz had a niggle in his hamstring early on in the week and we prepared all week with me and Hylts upfront. 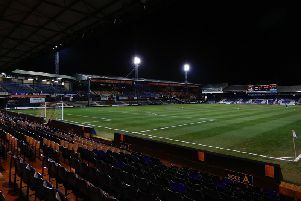 Even though Collins is by far and away Town’s top scorer this term, he knows he has to maintain his standards after Luton’s deadline day activity saw Jason Cummings and Aaron Connolly snapped up on loan. With Harry Cornick and Elliot Lee due to return too, Collins added: “No-one in that dressing room and that staff will let you come off it for a second. If you do you’ll get found and you’ve got people that come off the bench like George (Moncur) and Jason did. “They’ll take your place, so there’s no room for complacency. To have strength in depth like that on the bench and you’re forgetting lads that are not even in the squad, Glen Rea, Elliot Lee, Harry Cornick.